Lazar Angelov, bodybuilder and one of the best personal trainers ever. He has the body of a Greek God, strength of Hercules, and the patience of a monk. That’s Angelov from me to all of you and we are going to talk about how he made ‘Him’ happen. Prior to taking up body building and becoming the awesome personal trainer that he is, did you know that he was a professional basketball player for 10 years. The first phase of his career in basketball was for 8 years, after which he got a call to join the army, wherein he served for 9 months. When he came back from the Army he joined basketball again to get into shape after the 9 month break but he could only play the sport for 2 years owing to a chronic knee injury which limited his performance in the sport. Angelov was an enthusiastic sportsman and he was not someone who would sit quiet just because of a knee injury and that is when he took up body building which had always been his passion always. As a young boy he always wanted to be like Jean Claude Van Damme and that is what he has achieved today. Angelov’s greatest achievement, when he entered the bodybuilding arena in 2006, after he had quit basketball forever in 2005, was when he finished third place during the National Championship for Classic Bodybuilding. It was a great success for him because he was new in the field and still made it third place inspite of the lack of time to train and experience as well. Angelov has always been dedicated and professional towards his training and sports itself and he owes this to the years that he spent as a basketball player. He believes in always keeping sports in front of everything else in his life. 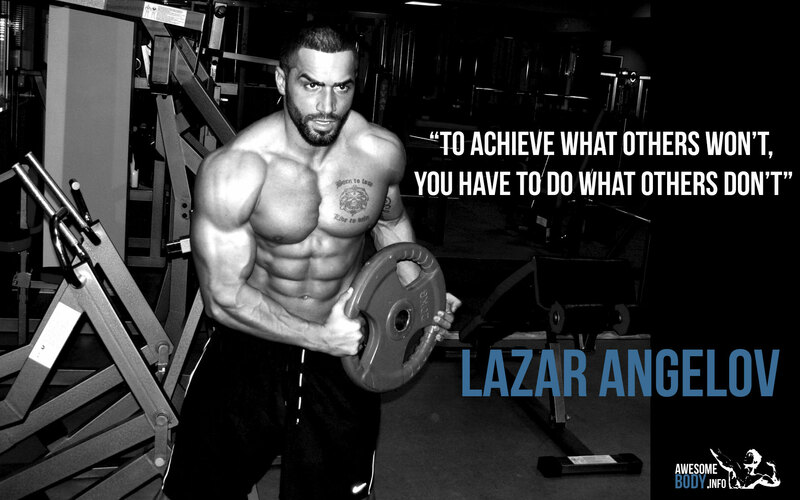 Lazar Angelov believes that he is his own competition when he is training in gym as this gives him motivation. Though Angelov loves training for every part of his body, his favourite part is training for his legs and chest. The harder the training the more fun it is for him. He avoids incorporating too much of cardio into his workout routine because it might cause him to lose muscle. The only time he feels a need to do cardios is when he needs to maintain a good heart condition. Angelov trains often and really hard with basic exercises and heavy weights within a month. He takes a break of 2-4 days in a month to give his body the much needed rest. Here’s Lazar Angelov’s workout regime for you below. Angelov likes to bulk up during winters for health reasons and his daily diet consists of six to seven small healthy meals. According to his need to bulk up in winters, Angelov’s body fat ratio ranges from 3% to 12%, season to season. Angelov follows the perfect diet for maintaining his perfect abs. He targets eating small meals every 2 hours and consumes 35grams of protein per meal. He makes it a point to avoid calorie restrictive diets as it might cause him to lose muscle mass. Well that was Lazar Angelov for you. Post in your comments below and let us know what you you think of his workout. We would like to hear from you. Till then see you. I have been doing this program for a month and the results are great. i changed it to 3 days workout so i can go six times a week, chest and biceps, back and triceps, and shoulder and legs. how long can i keep using this program for? if i need to change it what would you recommend ?